The Blackwell Companion to Greek Tragedy provides readers with a fundamental grounding in Greek tragedy, and also introduces them to the various methodologies and the lively critical dialogue that characterize the study of Greek tragedy today. 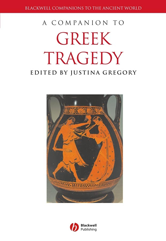 Comprises original essays by an international cast of contributors, including up-and-coming as well as distinguished senior scholars Pays attention to socio-political, textual, and performance aspects of Greek tragedy. All ancient Greek is transliterated and translated, and technical terms are explained as they appear.